Two years ago, trombonist Glen David Andrews could scarcely look up as he described his months "in exile" in Houston and the Federal Emergency Management Agency trailer he shared with relatives after Hurricane Katrina ravaged his hometown. "I feel ground down," he said then. But at last year's New Orleans Jazz & Heritage Festival, he bounded from the stage, gazed up and gleefully announced, "It's my time." On the night of the day soon-to-be-former U.S. President George Bush told the press that his government responded well to Hurricane Katrina, I spoke to Paul Sanchez. Sanchez, or “Poppy” as he is known to his friends, lives in the French Quarter and is well acquainted with the documented disaster that devastated New Orleans in 2005. “Well, it’s hard for some people to see beyond their own grand illusions,” said the seasoned singer-songwriter, who has written for, performed and recorded with some very solid names in the music business. Billed as the 10th Ritual, The 2008 Voodoo Experience in New Orleans featured top-shelf headliners Stone Temple Pilots, Nine Inch Nails, and the festival closer, REM—each a chart-busting superstar act that ostensibly delivered what the crowd expected and came to hear.Lie," and "Echoplex" as well as the best of their old and new catalogue. Keith I. Marszalek / NOLA.comPaul Sanchez performs at Voodoofest Friday, October 24, 2008. Fronting his Rolling Roadshow at the WWOZ/SoCo Stage, Paul Sanchez let it be known he knew exactly where he was. He rolled out "Exit to Mystery Street," the title track of his most recent CD and a reference to an entrance at that other big festival staged in the Esplanade Ridge neighborhood. "That's for a different fest on a different day," Sanchez said. "Today it's all about Voodoo." Fifteen years after local singer-songwriter Paul Sanchez released his solo debut "Jet Black and Jealous, " the title track has found new life in Nashville. Unbeknownst to Sanchez, successful country songwriter and publisher Travis Hill, who writes under the pen name Scooter Carusoe, had rewritten "Jet Black and Jealous" with a country flavor. The Eli Young Band, a popular contemporary country quartet from Texas, heard Hill's demo and recorded the song as the title track of its major-label debut for Universal Records South; Sanchez is listed as co-writer with Carusoe. Paul Sanchez was a founding member of Cowboy Mouth. He's recently left the group and is now on his own. His concerts are billed as the Paul Sanchez and the Rolling Road Show where he performs with different special guests. At the French Quarter Fest this year I happened to catch his show there with John Boutte, Shamar Allen and Susan Cowsill. To call it one of my favorite concert moments is an understatement. 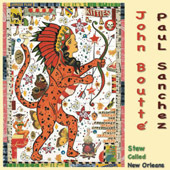 Paul Sanchez is one of the great New Orleans singer/songwriters, a fact that was somewhat obscured by his long tenure as a sideman in the legendary revival rock band Cowboy Mouth. Sanchez lost his house in Katrina, left the band, developed a seizure disorder that prevents him from traveling and is starting all over -- he and his wife, Shelly, are renters now and, instead of playing to packed audiences at college bars across the country, he's a small-room guy now, plying his impressive portfolio of songs written over the years, many of them archiving the New Orleans that used to be, and the one we've got now. Paul Sanchez and his Rolling Road Show will be appearing today at 5:50 p.m. on the Lagniappe Stage at the New Orleans Jazz and Heritage Festival presented by Shell. When talking to Paul Sanchez, he will mention a lot about the “cool cats” he has had the privilege of working with lately, but Sanchez is definitely a “cool cat” himself. Sanchez has been a New Orleans fixture for over sixteen years and seven solo CDs. Most recently, he has become a staple of the Frenchman Street scene playing regularly at d.b.a. Now he is preparing for his first solo performance at the Jazz and Heritage Festival. Sanchez’s career has spanned the last several decades, beginning with the Backbeat’s in the eighties. After spending time in New York and becoming involved in the “anti-folk” scene, Sanchez returned to New Orleans. He then spent the majority of the next sixteen years on the road, touring the U.S. and ten different countries with the rock band Cowboy Mouth. The New Orleans Jazz & Heritage Festival may have come and gone, but to an ever-growing number of diehards known as the Threadheads, the last day of Fest, (which is always the first Sunday of May) is really just the first day of planning for the following year. The Threadheads can be found chatting and planning on the official Jazz Fest website. It is here where, in late 2002, this community began to spread the love for all things New Orleans. The topics of conversation found in this forum aren't always about the Festival exclusively. If you want to know how Aaron Neville is dealing with his asthma, or what New Orleans Mayor Ray Nagin is up to, or if a new restaurant has opened in the French Quarter, there's a good chance the Threadheads will have the scoop before anyone else.